Dozens of Israeli settlers stormed on Friday morning Susiya area, south of Yatta, in the southern occupied West Bank province of al-Khalil, sparking terror among civilians. A PIC news correspondent said cars carrying fanatic Israeli settlers rolled into Susiya in the morning. Dozens of settlers stepped in the area and performed provocative rituals near Palestinian homes. The locals expressed concern that the break-in would herald an Israeli scheme to hold sway over Palestinian lands in the area in favor of illegal settlement expansion. “This is the land where our fathers, mothers, and forebears have set up roots for thousands of years. We will never ever give it up. Our land is worth our souls”, he added. Israeli police demolished on Thursday morning two Palestinian-owned houses in Beit Hanina town, in occupied Jerusalem, under the pretext of being built without permit. Police forces stormed the town early today accompanied with a number of bulldozers and started demolishing two houses belonging to Shawamra and Abu Armiya families. Israel has escalated over the past few days its demolition policy where a Palestinian house was demolished in Shufat neighborhood on Tuesday, while a Jerusalemite man was forced to demolish his own house in Silwan town on Monday. Meanwhile, Israeli forces destroyed water pipelines in Furush Beit Dajan village, east of Nablus. 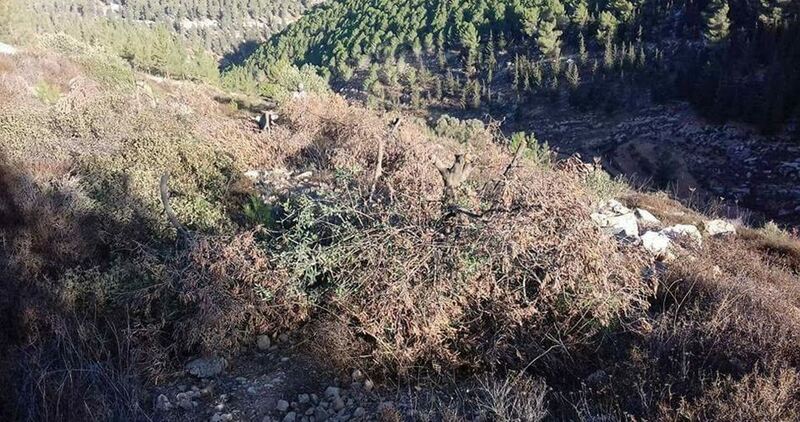 Deputy Mayor of Furush Beit Dajan, Azzam al-Hajj Mohammad, said that Israeli forces escorted bulldozers as they destroyed pipelines supplying water for farmlands and residential homes under the pretext of being unauthorized. Two Palestinian families demolished their own four homes with a heavy heart on Thursday, in East Jerusalem. 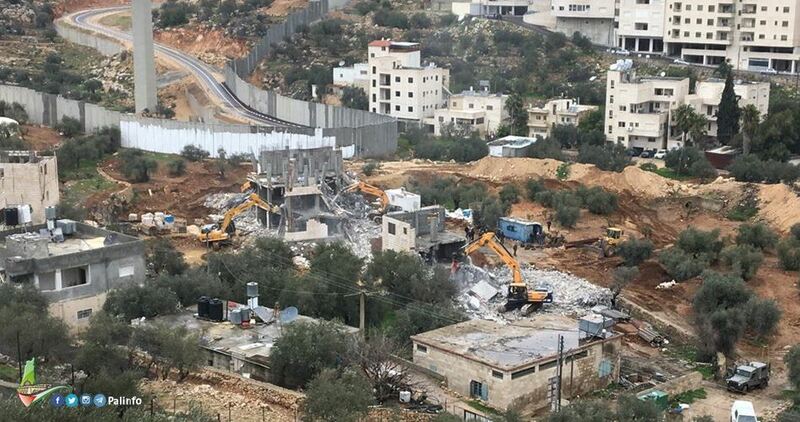 According to Ma’an News Agency, locals said that the two families, Shawamreh and Abu Rmeileh, watched as bulldozers demolished their four homes in the Beit Hanina neighborhood. The families, who were left homeless, pointed out that they have been living in their homes for about 17 years, and were proud for not giving up their homes to Israeli settlers. The total space of the land, on which the houses are built, is 3 dunams (0.74 acres). In 2006, an Israeli settler, Aryeh King, had claimed ownership of the land and orally informed both Palestinian families had built their homes; King had sent notices to the families to claim the land and demanding they pay rent. Later in 2013, King appealed to an Israeli court and highlighted, in the papers and documents, that the land is owned by settlers; the court then approved the land ownership to the Israeli settlers. The Israeli court ruled in favor of the settlers and granted them the land upon which the four Palestinian homes were built. The court sent a notice to the families to evacuate the area by August 1st. However, both families refused to evacuate the area. They feared that their homes would be taken to only become another illegal Israeli settlement point. 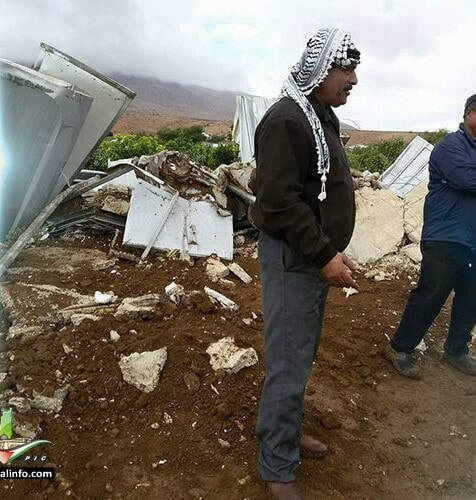 As a form of protest against the Israeli settlers attempting to displace them and gain their property, the two Palestinian families took the matter in their own hands and demolished their own homes. 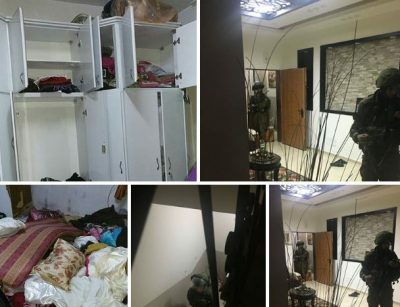 Under the pretext of building without a permit, Israeli authorities fined the Shawamreh family 120,000 shekels, while the Abu Rmeileh family was fined 75,000 shekels. 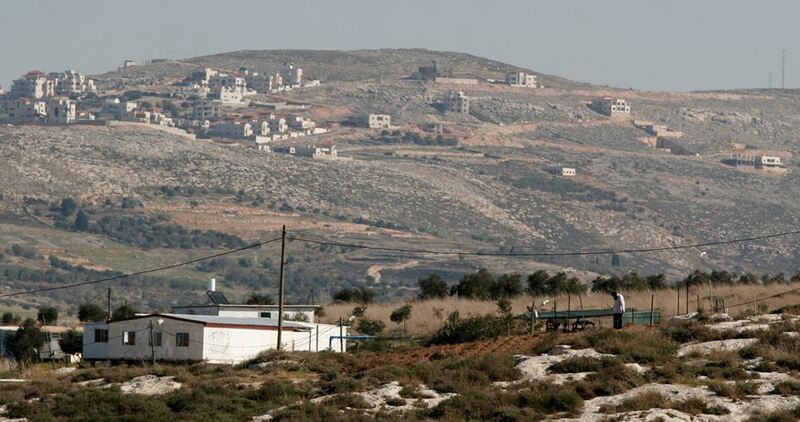 The Israeli authorities announced the illegal annexation of hundreds of Dunams of Palestinian lands in order to pave a new segregated road linking between the illegal colonies of Ofarim and Beit Aryeh, built on private lands, west of the central West Bank city of Ramallah. 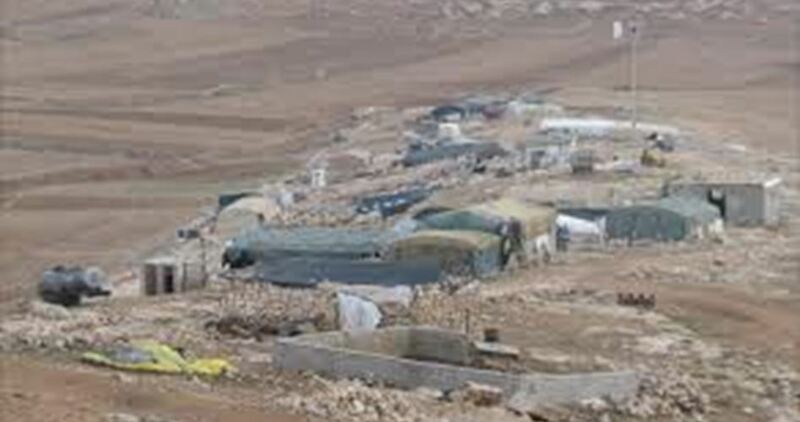 The Land Research Center (LRC) of the Arab Studies Society issued a statement, Thursday, revealing that the Israeli decision was made earlier this month, and aims at activating a structural plan, dubbed as 6/201, which aims at the illegal annexation of 324 Dunams of Palestinian lands in the al-Lubban al-Gharbi, northwest of Ramallah, and ‘Aboud village, west of the city. The LRC said that the structural plan aims at linking the two colonies, regarded by Israel as one settlement, by paving a new road, creating a constant geographic continuity, by illegally annexing more Palestinian lands. It added that the plan would likely lead to the construction a new colonialist neighborhood on the sides of the new road, which will eventually create a large block, leading to more illegal annexation of Palestinian lands, and the isolation of Palestinian communities. The LRC said that the new project, which declared the Palestinian lands as “state land” is an illegal measure that aims at surrounding and isolating the Palestinians, and stealing their lands for the benefit of Israel’s colonies, built in direct violation of International Humanitarian Law, the Fourth Geneva Convention and various resolutions and treaties. Israeli bulldozers on Wednesday demolished four Palestinian houses in Lod city in the central 1948 occupied Palestine for allegedly being unlicensed. 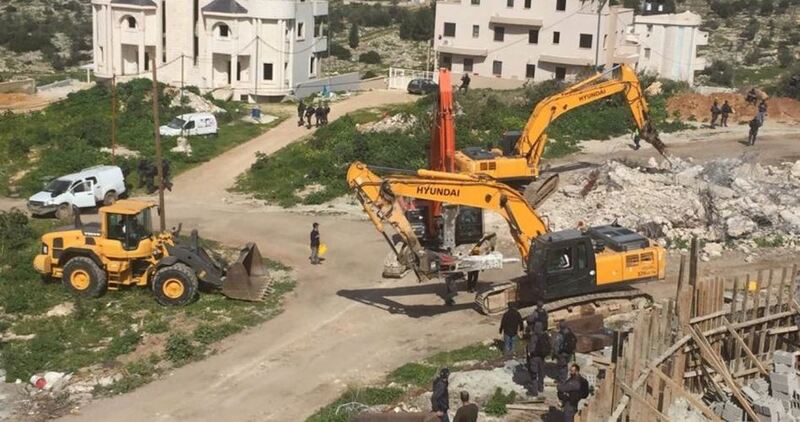 Local sources reported that Israeli bulldozers at daybreak stormed the city under the protection of Israeli police forces and demolished four residential buildings owned by al-Sani' family. They said that the demolition led to the displacement of at least 40 Palestinians living in the four houses. Al-Sani' family said that they were surprised by large police forces surrounding the houses and ordering them to leave to start the demolition. Representative of the Palestinian community in Lod Abdul-Karim Zabarqa said that the extremist Israeli government has recently stepped up its punitive measures, especially demolitions, against Palestinian citizens. Zabarqa added that a state of anger prevailed among the Palestinian citizens following the demolition, noting that the residents of Lod over the past weeks have organized a series of demonstrations in protest at the demolition policy pursued against Arab houses in the city. Israeli bulldozers at dawn Wednesday demolished two Palestinian houses in al-Duyuk al-Tahta area in Jericho city. 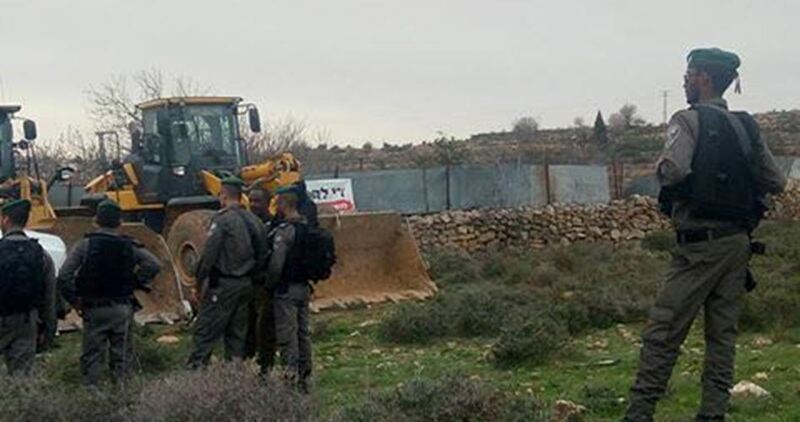 Local sources reported that Israeli bulldozers stormed the area early Wednesday under the protection of Israeli occupation forces. The sources added that the two houses were knocked down under the pretext of being unlicensed.